Allergens and respiratory pollutants is a collection of 12 authoritative papers that draws upon the collective expertise of world leaders in the fields of innate immunity, immunotoxicology and pulmonary biology. 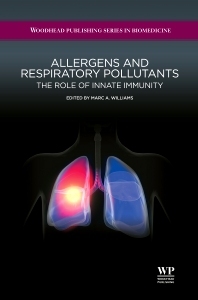 The book critically explores the biological and immunological mechanisms that contribute to immune dysfunction on exposure to allergens and the susceptibility to infectious disease on exposure to ambient pollutants. The clinical relevance of exposure to ambient airborne xenobiotics is critically discussed and collectively, this book provides an educational forum that links the health effects of environmental exposures, immune dysfunction and inflammatory airways disease. Dr Marc A. Williams is a Biologist with the United States Environmental Protection Agency, Research Triangle Park, USA and a former Assistant Professor of Medicine and Environmental Medicine at The University of Rochester School of Medicine and Dentistry, USA and Instructor of Medicine at The Johns Hopkins University School of Medicine. He has a long-standing interest and program of research in the field of immunotoxicology and innate immunity. Currently, he is studying the cell-mediated and molecular mechanisms involved in the dysfunction of the pulmonary immune system and the role played by respirable ambient pollutants including diesel exhaust particulate matter and ambient airborne particulate matter in that process. Dr Williams has a distinguished career in basic and translational scientific research. He serves on numerous national leadership committees including those of The American Thoracic Society (ATS) and The American Academy of Asthma, Allergy and Immunology (AAAAI) and is a fellow of AAAAI. Dr Williams also serves as Associate Editor of Stem Cells and Development and of The Journal of Innate Immunity and serves on the editorial boards of several others including Biomarker Insights, Journal of Receptor, Ligand and Channel Research and ScientificWorldJournal (Immunol & Inflammation Domain). Dr Williams is listed in Marquis Who's Who in America and Cambridge Who's Who of Professionals. He has also been recognized through membership of The Faculty of 1000 (Immunology - Section on Innate Immunity) and is the author of more than 60 original research papers, invited reviews and editorials.